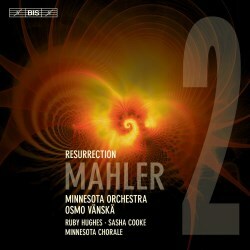 This is the third instalment in Osmo Vänskä’s projected Mahler cycle with the Minnesota Orchestra. I reviewed the initial release, finding much to enjoy in Vänskä’s reading of the Fifth symphony, though my welcome for it was tempered by serious reservations about his way with one movement: the celebrated Adagietto. Since then the Sixth has been released. I’ve not heard that but I see that my colleague Brian Wilson was not too impressed (review). What will the Finnish conductor make of the ‘Resurrection’? I must say that I was taken aback by the swiftness of Vänskä’s attack on the symphony’s opening. It’s not just the speed at which those dramatic figures on cellos and basses are played that startled me; it’s also a question of how little space there is between them. There are 6 ½ crotchet beats between the first of these little figures and the second but you’d never guess that from the way in which Vänskä despatches them. Indeed, the first five dramatic bars are over in a flash. It may seem like a very small point but surely the best way to present this opening is to combine urgency and breadth, as conductors such as Klemperer, Rattle and Tennstedt do. From bar 6, Vänskä settles down to a much more conventional speed as the cellos and basses begin the funeral march but he’s not, as the score instructs, a tempo. The funeral march itself is well done but after a while Mahler slows for a nostalgic reminiscence (5:58). Unfortunately, I think that Vänskä slows far too much and as a result over the next 3 ½ minutes or so the performance risks being becalmed. In his live reading, Klaus Tennstedt often resorts to expansive speeds, especially in the outer movements, but his reading has a compelling magnetism, lacking in Vänskä’s, that means he gets away with it. By now, I was getting the feeling that Vänskä’s is something of a performance of extremes as far as speeds are concerned. Much of what he does is convincing – and very well played – but every so often a tempo selection comes as a jolt. So, for instance, at cue 20 in the score there’s a brief passage marked Molto pesante where virtually the entire orchestra hammers out an identical rhythm. I’ve heard a variety of speeds adopted for this dramatic passage – Rattle, for instance is far too slow in his 1986 Birmingham record (the 2010 Berlin remake is better in this respect) – but Vänskä is far too quick. He’s far from being alone in that in my experience, but even so, the shattering import of the moment is diminished. By contrast, I feel he’s too indulgently broad around 19:00. In fairness, the passage is marked Immer noch mehr zurückhaltend (Ever more holding back) but even so I think Vänskä takes this too far. The conclusion of the movement (from 20:08) is impressively built though I have to say that I find Rattle generates even more ominous tension in his two recordings, especially the live Berlin version. Incidentally, the track timing on the BIS disc is 23:17 but the actual playing time extends to 23:38 in a nod to Mahler’s request for a substantial break between the first two movements. I’ve dwelt at some length on Vänskä’s account of the first movement because that’s where I find his performance controversial. The rest of the reading seems much more satisfactory to me. He adopts a nicely relaxed approach – and pace – for the second movement. Here, the Minnesota strings play very stylishly and the recording differentiates very well indeed between the various string parts. (Judging by what I hear and the photo on the back of the booklet, Vänskä divides his violins left and right with the cellos next to the firsts and the violas between the cellos and the second violins.) Detail is very well observed in this account of the movement. The third movement is also largely a success though I do wonder if the passage beginning at 4:51 is not taken a bit too swiftly to make proper sense of the music. On the other hand, the sardonic humour comes across well – as is in keeping with the original Knaben Wunderhorn song on which the movement is based. The orchestra points the music very effectively with special praise for the woodwind in this regard. The wild premonition of the finale (8:03) is projected with dramatic force and urgency. Sasha Cooke sings Urlicht very well indeed. She may not be as individual a singer as, say, Dame Janet Baker or Magdalaena Kožená on the two Rattle recordings. However, there’s a great deal to be said for her approach, which certainly doesn’t preclude eloquence. I like the sound she makes very much indeed. Perhaps Vänskä’s speed for the first half of the song is a fraction too broad but, if so, it’s not by much. The huge finale is unleashed in dramatic fashion and the vivid impact of the bass drum stroke is typical of the quality of the BIS recording. The engineers’ skill is further demonstrated by the way in which the remote offstage brass are reported, both early on in the movement and during the grosse Appell. I think that Vänskä handles this vast musical fresco pretty well. The drama is projected strongly, not least in the huge march episode that follows those two apocalyptic percussion crescendi (9:21). The grosse Appell is impressive (17:16): the distant brass is very well handled in the recording and the solo piccolo and flute distinguish themselves. When the choir begins to sing (20:01) their sound is hushed but distinct, which is as it should be. Ruby Hughes’ silvery voice rises gently and sweetly from the midst of the singers at the end of the first long phrase. Miss Hughes does very well, too, in the ‘O Glaube’ duet with Sasha Cooke. Perhaps the soprano’s voice isn’t quite strong enough in the lowest-lying stretches of this episode but, that very minor reservation aside, the two voices blend well. When the full forces are unleashed at the fortissimo statement of ‘Aufersteh’n’ the effect is most impressive, as is the purely orchestral peroration at the very end, though I’d have liked to hear more of the organ. That said, the last few minutes of the symphony, while sonorous and imposing in this performance, didn’t seem as emotionally overwhelming as some performances I’ve experienced – I think, in their different ways, of the aforementioned Klemperer and Rattle readings or, indeed, the one conducted by Jonathan Nott. As for Tennstedt, the stupendous conclusion of his once-in-a-lifetime live performance, with the performers seemingly finding that they had more to give than they ever knew, will simply leave you gasping. Despite my reservations over his way with the first movement, there’s much about Osmo Vänskä’s traversal of ‘Resurrection’ that’s highly commendable. In any case, other listeners may more readily embrace all aspects of the interpretation. The performance is highly accomplished. Vänskä has a good choir at his disposal and two excellent soloists. As for his orchestra, they play the music marvellously. There are many idiomatic touches such as string portamenti while accents – so crucial in Mahler – and dynamics are scrupulously observed. All departments of the orchestra distinguish themselves and so it’s good that they are heard in such excellent sound. Engineers Jens Braun and Matthias Spitzbarth reproduce the performance in a spacious recording that brings an abundance of detail to the listener’s attention and also an impressive ‘big picture’. The excellence of the recording applies right across an impressively wide dynamic range. I listened to this SACD using the stereo option and I found that it reproduced very well; there’s no loss of quality despite the extended playing time. The booklet contains a good note by Jeremy Barham. I must say that, after hearing two instalments of his cycle, I’m still on the fence about Osmo Vänskä’s Mahler. There’s much about it that’s good – even very good – but I’m yet to be convinced that he’s as authoritative and displays the kind of natural affinity with the music in the way that I’ve come to take pretty much for granted when he turns his hand to Sibelius or Nielsen.